Raulet and Olivier Baroin’s homage to the Parisian jeweller. All in their early 20s at the end of the First World War, these young artists moved away from traditional formal jewellery and drew their ideas and inspiration from each other. During the 1920s, the aesthetic revolution in the applied arts favoured the publication of theoretical texts written by the jewellers which explained their ideas about modern jewellery. In August 1929, an important article by Gérard Sandoz, entitled Jewellery Today, appeared in La Renaissance de l’Art Français et des Industries de Luxe (The Renaissance of French Art and the Luxury Industries). The author summarised the aesthetic ideas to which he and Suzanne Belperron subscribed. “Jewellery, today directly inspired by our contemporary taste, must be simple, clean, and made without embellishment. Provided that the production technique is impeccable, a piece of jewellery worth two hundred francs may be just as beautiful as an equally well-designed piece worth two million. We can make very beautiful jewellery using nothing but gold, and monstrosities out of trays of diamonds. We can work wonders with brilliant-cut diamonds carefully spaced or in clusters but do silly things with strings of gold. Let us not have any preconceptions with regard to the material. Personally, I believe that it is first necessary to think of the line and the general volume of jewellery to be created”. Each piece of Suzanne Belperron’s jewellery was born of many sketches in gouache, drawn by her or adapted by her assistant and redone as many times as necessary until the design resembled her creative idea. Production would then take place with the help of the Groëné et Darde workshop. The three-dimensional visualisation of the proposed piece would be aided by the creation of a life-size maquette – in plastilina, in zinc, in silver, in copper or in wax at different times – onto which the placement of the stones was traced in Indian ink. In terms of production itself, the wax maquettes were used to specify dimensions but never for actual casting. 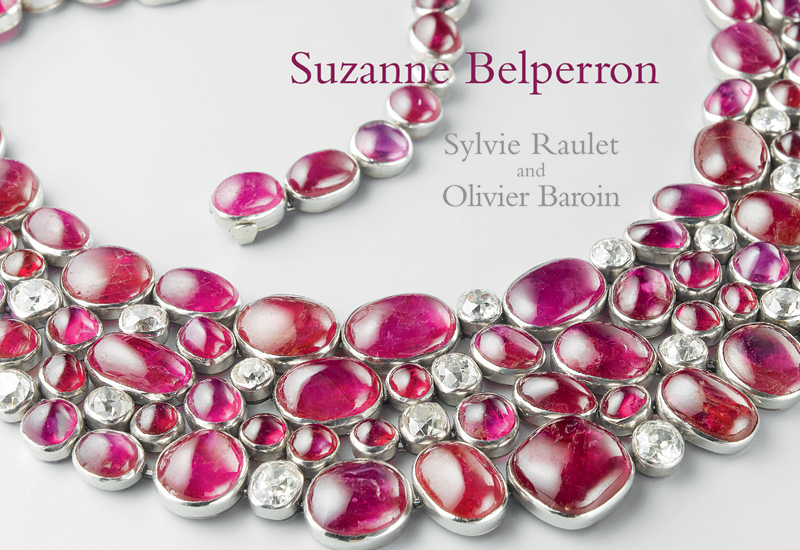 Suzanne Belperron never allowed jewels to be created by lost wax casting. Like a workshop foreman, Suzanne Belperron kept a strict eye on the completion of each stage of manufacture, anxious that it should be perfect and that nothing should be left to chance. To this end, she set up a daily meeting at the salons in the rue de Châteaudun with the head of the workshop, Roger Darde, who had succeeded his father Émile. According to him, Suzanne Belperron had a “pair of compasses in her eyes”. From 1928 to 1955, the Groëné et Darde company (situated at 12, rue Saint-Gilles) had as its maker’s mark the initials G. D. surmounted with Ste intertwined with a fleur-de-lys. From 1955 to 1970, Darde et fils kept the same address but used the initials D. F. around a fleur-de-lys as the company maker’s mark. From 1970 to 1974, Darde & Co. (of 11, rue des Petits-Champs) had a mark of the initial D followed by a fleur-de-lys surmounted with Ste which was, in turn, followed by the initials C. I. E. These different marks, which are obligatory by law and of great importance to historians and jewellery experts, allow Suzanne Belperron’s creations to be approximately dated. However, there is a tricky problem for all the jewellery created in hard stones such as transparent rock crystal or frosted glass, smoky quartz, agate and chalcedony: these materials do not allow marks to be applied. Only the archives rediscovered by Olivier Baroin in 2007 make it possible to go back to the original order of the pieces of jewellery and to identify those that are not by Suzanne Belperron. The traceability of the jewels in the archives which can now be consulted is important. For example, there is the case of the creations by the jeweller Max Boinet, who was often inspired by her designs and employed Adrien Louart, her appointed stonecutter. The ease with which small pieces of hard stones can be reproduced, resulting from the development of industrial processes and the relative price of stonecutters in the Middle East, also makes it hard for the experts to date them.